Rotherham Titans captain Tom Calladine says he had no hesitation in making the switch to Doncaster Knights. The 29-year-old back rower spent three seasons at Clifton Lane but arrived at Castle Park this summer. “Since coming up from National One they’ve been a stalwart team really and the club always looks to push to be a top four or five side and with those aspirations I thought this something I want to be part of,” Calladine told Knights’ official website. “I knew a few lads here before I signed as I have been playing in the Championship long enough. 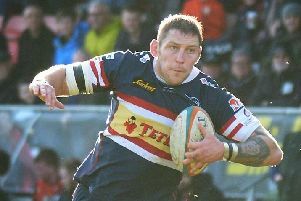 Calladine previously played for Nottingham Rugby, Hartpury, Linwood in New Zealand and his hometown club of Mansfield RFC. He is a former England U16 and U18 representative.